Here I present the “Monkey King Subdues the White-Bone Demon: A Study in PRC Mythology” chapter from The Contemporary Chinese Historical Drama (1990). This fascinating chapter discusses how a play/film based on the named Journey to the West episode was co-opted during the mid-20th-century as Communist propaganda. Of note is the way each figure is associated with a particular aspect of the communist party. For example, the group of pilgrims represents the party itself, Sun Wukong represents Mao Zedong, and the White Bone Demon, while first representing Imperialism, came to be associated with Soviet Revisionists bowing to imperialism. While the monk Tripitaka was originally associated with the Revisionists Eduard Bernstein and Nikita Khrushchev, he later came to represent the “Middle-of-the-roaders” within the Chinese communist party. It should be remembered that, in the particular episode from the novel, Monkey keeps killing the White Bone Demon because he sees through her demonic disguises, yet the monk continues to punish his protector via the Tight-fillet spell because he is continually deluded by said disguises. Therefore, the play/film was symbolic of Mao’s struggle to placate the communist party while trying to battle the evil of revisionists. Most surprising to me is that the play/film was made into a children’s book. I believe I’ve seen the illustrations (fig. 1) on the internet but never realized the book had a political origin and purpose. Fig. 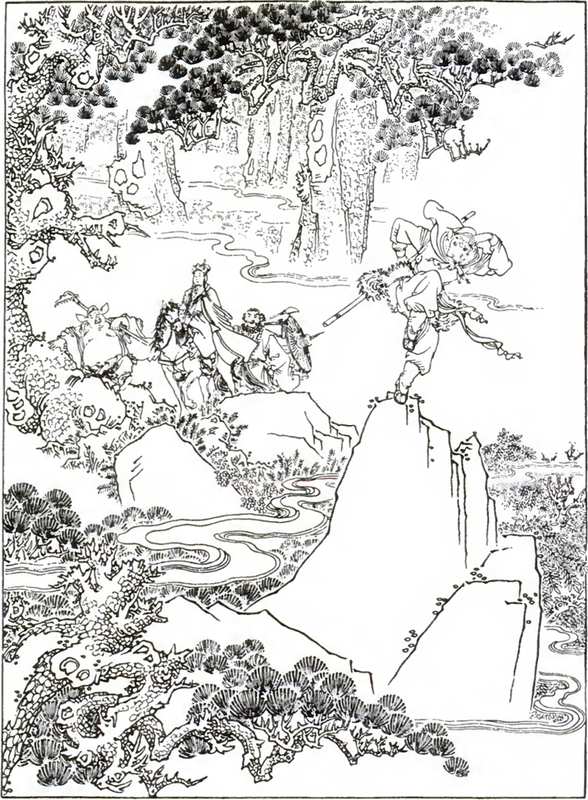 1 – Page one from Sun Wukong sanda baigujing (1962) (larger version). A PDF of the full book can be found on archive.org and downloaded for free.